Last November I told you I finally found a suitable replacement for Intuit’s Quicken personal finance software, after nearly 15 years of searching. That replacement was iBank and I’m still totally happy with it. I know I ought to be thrilled that Intuit will provide a Lion-compatible version Quicken 2007 sometime in 2012, but I’m not. For one thing, I don’t trust Intuit, which has shown a remarkable lack of respect for Mac users over the years. For example, it has frequently updated Windows versions while there hasn’t been a new Mac release since 2007. And it has discontinued the Mac version at least twice since I’ve been a user. Make that three times. 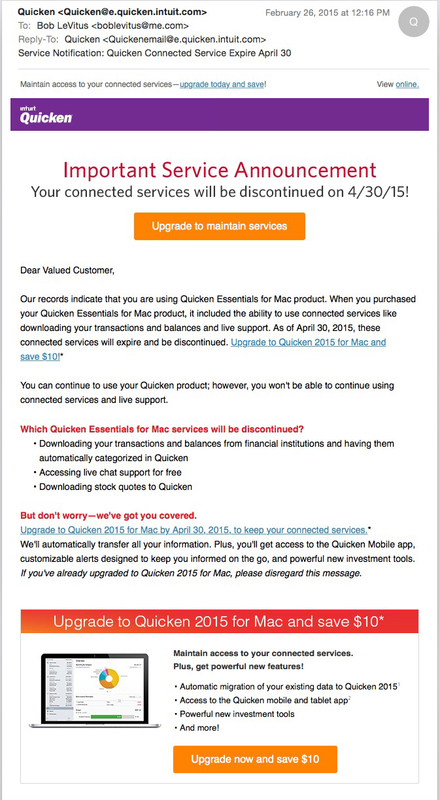 Last week, Intuit sent an email to users of Quicken Essentials for Mac: Your connected services will be discontinued on 4/30/15. Upgrade to maintain services. But don’t worry — we’ve got you covered. Upgrade to Quicken 2015 for Mac by April 30 to keep my connected services and save $10. You’re going to make it stop working (at least for me) on April 30. And I’ll save $10 when I upgrade. It didn’t sound so bad, and they did address me as "Valued Customer," so I clicked the Upgrade Now and Save $10 button. Not that I intend to ever use an Intuit product again, but I did expect the upgrade to be free given that it's only necessary because Intuit is crippling the current version on April 30. I was shocked to discover that not only was it not free, it costs $74.99, ($64.99 with the $10 discount). ARE YOU OUT OF YOUR FREAKING MINDS, Intuit? In what alternate reality where paying you more money to upgrade an application you just crippled can be seen as, "having me covered?" To be fair, I asked if Intuit had any comment; I was referred to two webpages — the first explaining the aforementioned email; the second describing Intuit's “discontinued services” policies. While they make it clear when and why Intuit discontinues connected services for its products, I don't recall being informed that my copy of Quicken Essentials would expire after x years. And without connected services, it would be worthless to me. Fortunately, as I wrote last November, I don't have to deal with Intuit anymore. 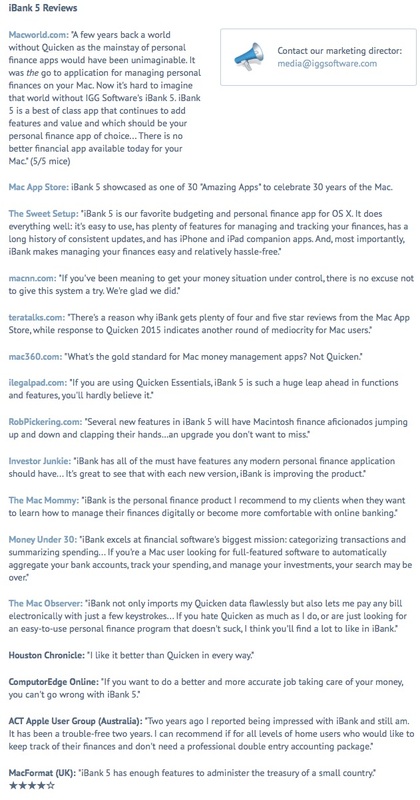 iBank 5 from IGG Software is not only better than anything Intuit has ever made for the Mac, I'm confident that it's better than anything Intuit will ever make for the Mac. IGG Software is an Apple-only developer; it ONLY makes apps for the Mac (and iDevices). I'd like to think the company understands us. And I know that, unlike Intuit, IGG Software treats its Apple users with more than a modicum of respect. Finally, iBank costs a bit less ($59.99) than Intuit’s shoved-down-your-throat upgrade. Even though it doesn't affect me, purposely crippling Quicken Essentials and charging $65 for a so-called upgrade is unconscionable. While it's been said that even bad publicity is good, I won't even give you bad publicity anymore. Savor my parting words: So long, Intuit, and thanks for all the... nothing.